This means focusing on an employee’s health and well-being is necessary for optimum productivity. This requires a multifaceted, holistic approach that interweaves three main components: health, well-being, and performance. 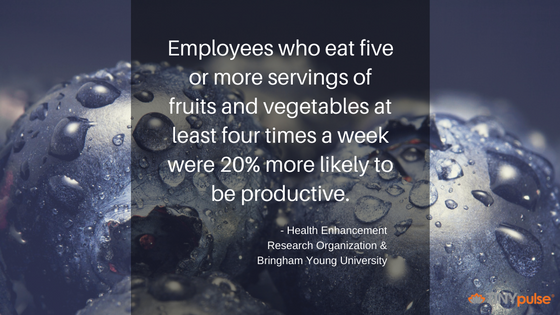 Research done by the Health Enhancement Research Organization and Brigham Young University in 2013 found that employees who ate healthy all day long were 25% more likely to have higher job performance. Those who ate five or more servings of fruit and vegetables at least four times a week were 20% more likely to be more productive. But what does eating healthy mean? That can be difficult to define since everyone has their individual needs, but typically, a balance of carbohydrates (whole grains, fruits, and vegetables), healthy fats (coconut and olive oil, avocado, nuts, and seeds), and proteins (eggs, beans, meats, and cheeses) will help zap cravings and keep your body functioning at an optimal level. A well-rounded diet including each of these macronutrients will sharpen your mental focus and concentration, boost energy, and stabilize blood sugar. That last part is especially crucial, as low glucose levels can contribute to poor self-control and decreased attentiveness and ability to cope with stress. Don’t forget the importance of water: dehydration will deplete you of energy much quicker than hunger. And this is where a corporate wellness program comes into play. Rewarding employees with points for eating healthy will not only help your workforce improve their well-being, but will also show that you not only care for them as a worker but also as a human being. When most people think of corporate well-being programs, they think about yoga at the office or an on-site gym. But it turns out that well-being isn't just limited to the physical aspect — it also includes emotional, financial, and work well-being. So what does that mean exactly? Let's start with the emotional aspect. When employees are stressed, they can't perform their best. 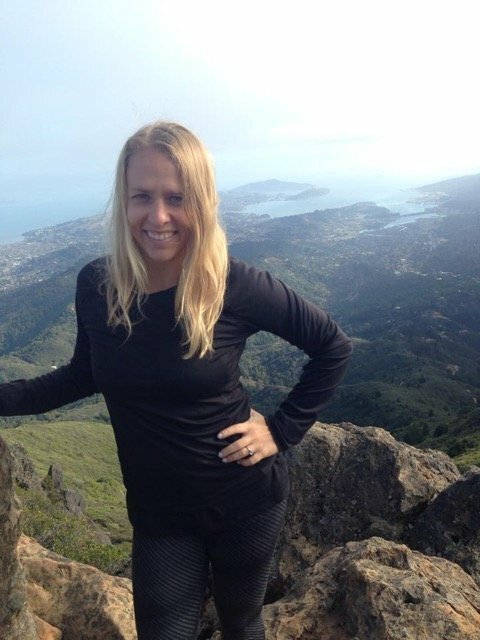 What about financial well-being? Well, raise your hand if you’re swimming in a mound of student loan debt. 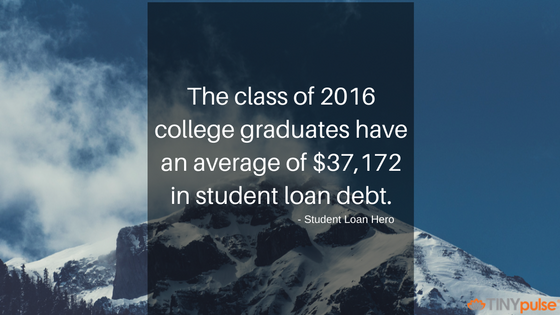 According to Student Loan Hero, the average class of 2016 graduate has $37,172 in student loan debt. Receiving financial advice and learning how to maintain finances helps eliminate stress, which is also connected to an employee's emotional well-being. And work well-being? 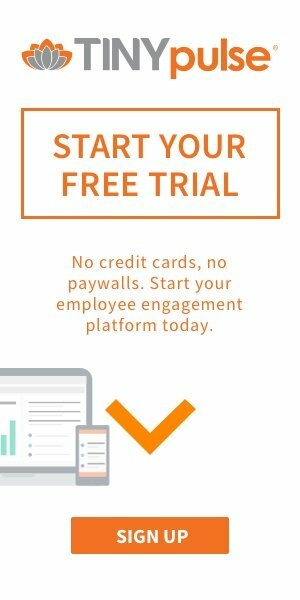 How happy are your employees? Are they feeling overwhelmed? Maybe they're not getting along with their direct supervisor. Measuring workplace sentiment allows employers to build a better workplace where employees thrive. Even if you’ve nailed down those first two points, all that work can be quickly nullified if you’re in constant fight-or-flight mode due to stress. 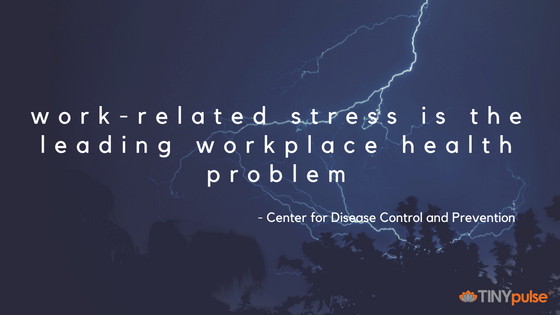 According to the American Psychological Association’s 2012 Stress in America Survey, 65% of Americans cited work as a top source of stress. Excessive pressure on the job leads to dissatisfaction, disengagement, absenteeism, and ultimately a loss in productivity. One way to combat this is to encourage employees to take multiple breaks daily (set an alarm every 90 minutes if you have to). Even 10 minutes away from your desk can help refresh the brain and boost energy levels. And be sure to let employees indulge in some much-needed time away from the office too. Americans don’t do this enough — even when they can. In fact, a study done earlier this year by the U.S. Travel Association’s Project Time Off found that more than half (55%) of US workers didn’t take all of their vacation days in 2015. So, yes, ignoring the mind and body’s need to refuel and recharge can negatively impact both the employee and employer. More time at the office doesn’t always mean greater productivity, especially when you have an unhealthy, unhappy, burned-out staff.